The tubular nephron is responsible for reabsorption and catabolism of filtered low molecular weight proteins that include Ig free light chains. In the setting of a plasma cell dyscrasia, significant amounts of free light chains, now monoclonal proteins, present to the tubular nephron for disposal. The result may be clinical renal dysfunction in the form of AKI, progressive CKD, and end-stage kidney disease. Here, I review the mechanisms involved in these processes that result in tubular injury, including proximal tubulopathy and cast nephropathy. One hundred sixty-seven years ago, some of the best physicians in the world struggled to understand the disease causing excruciating pain in their patient. The physicians identified a unique protein in the patient’s urine and asked the prominent chemical pathologist, Henry Bence Jones, for assistance. Bence Jones was unable to determine accurately the nature of this urinary protein that now bears his name, but he correctly surmised that the presence in the urine of Bence Jones protein served as a biomarker associated with mollities ossium, now known as multiple myeloma.1 More than a century later, Gerald Edelman, who received the Nobel Prize in physiology and medicine for elucidating the structure of antibody molecules, reported that Bence Jones proteins were Ig free light chains (FLCs) that appeared in the urine in the work by Edelman and Gally.2 In a subsequent account of the events (http://www.webofstories.com/play/15758), Edelman suggested that this discovery was the end of the story on Bence Jones proteins, but for nephrologists, the story was just beginning. More recent efforts have shown that polyclonal FLCs are produced daily during normal lymphoid metabolism and appear in the serum in significant amounts. Kidney function is essential in clearing FLCs, because nephrectomy prolongs the plasma half-life of these low molecular weight proteins but does not affect the half-life of high molecular weight proteins such as IgG.3 FLCs, but not IgG, are readily filtered through the glomerulus and appear in the tubular lumen,4 but they are rapidly reabsorbed by the proximal tubular epithelium after binding to a heterodimeric receptor composed of megalin and cubilin.5–7 This system is saturable but very efficient; therefore, under normal conditions, the majority of FLCs is removed from the tubular fluid, and little appears in the urine.8 However, when a plasma cell dyscrasia develops, the production of FLCs, now predominantly monoclonal proteins, increases, and circulating FLC levels can approach 100,000 mg/L.9 As a consequence, proximal tubular reabsorption can become saturated, and FLCs appear in the lumen of the distal nephron and finally, the urine as Bence Jones protein. Depending on the structure of the FLC (Figure 1), several renal tubular lesions may ensue, and they are the subject of this review. Schematic of FLCs. FLCs are modular proteins composed of two domains: a variable (VL) and a constant (CL) region. Within the VL domain are the framework regions that form a hydrophobic core.52–55 Three hypervariable segments (CDR1 and CDR2 in blue and CDR3 in red) produce loop structures that interact with antigen. Thus, FLCs have similar biochemical properties, but no two FLCs are identical. Clinical and laboratory evidence suggests that each FLC has unique toxicity that is related to the amino acid composition of one or more of the CDRs. This unique proximal tubular lesion may represent a subset of gammopathy-associated crystal-storing histiocytosis, in which crystal-forming monoclonal Igs, composed of heavy chains and typically, κ-FLC, accumulate in lysosomes of histiocytes in soft tissues, kidney, bone marrow, spleen, liver, stomach, and other organs.13 Involvement of the proximal tubule occurs specifically when the monoclonal FLC is overproduced, because intact Ig is not filtered through the glomerulus. Schematic representation of the effect of monoclonal FLCs on function of proximal tubular epithelial cells. Endocytosis of monoclonal FLCs generates intracellular oxidative stress,23,24 which activates ASK1. ASK1, in turn, activates the intrinsic apoptotic pathway that results in apoptosis. Monoclonal FLCs can activate c-Src kinase, which activates the canonical and atypical NF-κB pathways, but it also promotes a prosurvival signal through activation of Akt, which phosphorylates ASK1 at S83 to promote the downregulation of ASK1 activity.25 The combined effects of c-Src kinase activation might be to mitigate cell death and also promote an inflammatory response. MAP3K, mitogen-activated protein kinase kinase kinase. The clinical effects on proximal tubule function seem to be significant. Apoptosis is a feature of experimental monoclonal FLC-induced renal failure in animals.30 An isolated proximal tubulopathy that promotes clinical manifestations of renal failure associated with monoclonal FLC-induced proximal tubular injury is much less common than cast nephropathy.14,39 However, the direct cellular effects of FLC may be important in cast nephropathy (discussed below) by not only promoting apoptosis but also generating an intrarenal inflammatory milieu that promotes the rapid tubulointerstitial fibrosis40 and progressive renal failure that is often observed after a bout of AKI in patients with multiple myeloma. 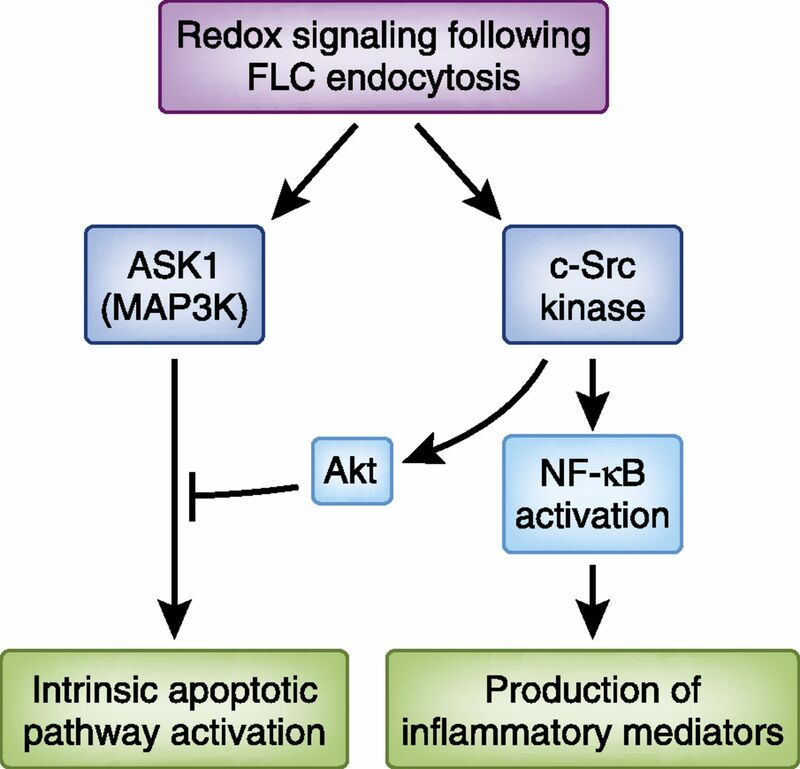 As shown by the experimental work from the laboratory of Batuman that was published in the work by Arimura et al.,41 interventions designed to inhibit or counteract these redox-signaling pathways may, therefore, prove to be beneficial in myeloma kidney. The dominant tubulointerstitial lesion associated with multiple myeloma is cast nephropathy. The characteristic finding is the presence of multiple intraluminal proteinaceous casts. The casts are usually acellular, homogeneous, and eosinophilic with multiple fracture lines. An interesting giant cell inflammatory reaction develops if the casts persist. Tubular atrophy and interstitial inflammation accompany the casts, and some works suggest that the term—myeloma kidney—is, therefore, perhaps more appropriate than cast nephropathy. For the chronic progressive kidney disease, the potential involvement of the proximal tubule, along with cast formation, supports the use of this term. However, experimental evidence confirms that intraluminal cast formation is the proximate cause of AKI and likely, the initiation step in the subsequent progressive deterioration in renal function. Tamm–Horsfall glycoprotein contains of a series of domains that include epidermal growth factor-like domains, two zona pellucida domains (ZP-N and ZP-C), and a central region, termed D8C. The D8C region contains the FLC-binding domain. Recent data suggest that the cysteines present at the N and C termini of the FLC-binding domain are linked through an intramolecular disulfide bridge, which places the two histidines in close proximity to permit potential ionic interaction with the CDR3 domain of FLC.50 Modified from reference 50, with permission. Capitalizing on this latter observation, a recent study analyzed this interaction and showed that the secondary structure and key amino acid residues on the CDR3 of the FLCs were critically important determinants of the molecular interaction with Tamm–Horsfall glycoprotein. These findings permitted development of a strongly inhibiting cyclized competitor peptide. When used in a rodent model of cast nephropathy, this cyclized peptide construct inhibited cast formation and the associated functional manifestations of AKI in vivo.50 These experiments critically show that intraluminal cast formation was integrally involved in the pathogenesis of AKI from cast nephropathy. Furthermore, the data support a clinically relevant and novel approach to the management of FLC-mediated AKI in the setting of multiple myeloma.50 Finally, the luminal environment can affect binding of the offending FLCs with Tamm–Horsfall glycoprotein. Therefore, in addition to effective chemotherapy and other developing treatment strategies, clinical efforts to increase tubular fluid flow rates, such as increasing water intake, avoiding agents that alter intrarenal hemodynamics (nonsteroidal anti-inflammatory agents), and limiting intraluminal sodium concentration through avoidance of diuretics when circulating FLCs are high, are additional interventions that may prevent progressive renal injury. Although oncologists might focus on the M protein, nephrologists must determine renal risk to tubular function by assessing circulating monoclonal FLCs. In one large study of multiple myeloma, for example, renal failure was present in approximately 2% of patients who did not have significant urinary FLC levels. In contrast, increasing urinary FLC levels strongly associated with renal failure, with 48% of patients who had high urinary monoclonal FLCs also showing renal failure and associated poor survival.51 The advent of a nephelometric assay that quantifies serum FLCs represents a significant advance, because the filtered load of the monoclonal FLCs may be extrapolated to risk to renal failure, permitting earlier intervention in the management of these patients. A basic knowledge of the renal handling of proteins is key to understanding the pathomechanisms involved in FLC-mediated tubular injury and providing appropriate therapeutic interventions in the management of tubular injury in myeloma. By uncovering the underlying renal tubular pathobiology and showing new therapeutic interventions, the field has progressed significantly since the initial observations of Henry Bence Jones, but additional work is needed before declaring an end to the story on Bence Jones proteins. The laboratory of P.W.S. is supported by National Institutes of Health Grants R01 DK046199 and P30 DK079337 (George M. O'Brien Kidney and Urological Research Centers Program) and the Office of Research and Development, Medical Research Service, Department of Veterans Affairs. Paraprotein-Related Kidney Disease: Kidney Injury from Paraproteins--What Determines the Site of Injury?